Growing up I always wanted to have a school locker just like the school kids I saw on Saved By The Bell and Beverley Hills 90210. I couldn’t wait to get to Secondary School and have a locker of my own. Unfortunately, the year I started at “The Comp” they did away with lockers and although the space they used to occupy was always called “the locker corridor” sadly the actual lockers existed no more. Danny’s locker has two doors. In the bottom section, he keeps all of his school books in a pile and his clean PE kit in a bag. We’re going to have a look at the top section. Lockers generally have a lot of vertical space which is often left redundant, so we tried to make the most of the space. I had hoped to make a little shelf but sadly the best made plans didn’t come to fruition (who knew that magnetic tape was not strong enough to hold a desk tidy full of stationery? Hmmm…), however, we’ve still used the space fairly efficiently. All of the accessories pictured are from Hobbycraft . These chalkboard labels make great mini chalkboards on the locker door and are also great for labelling Danny’s files and folders. So that Danny always has chalk to hand, we tied a piece of chalk to string and stuck it up with some music themed washi tape to represent his love of music. The brown box contains spare chalk and we also added some fun stickers. Danny has a few A4 boxes to store paper, sheets and homework in tidily- rather than the scrumpled up bits of paper that he normally presents to me! These A4 boxes are handy as they make a shelf. There is also room left to the side for A4 file folders and envelope files- again handy for bringing in homework and letters to school. We added a mini calendar (I put it up with washi tape as I love this design but it could be stuck up more sleekly with magnetic tape). On top of his files, is his current notebook for notes during his homework. I love the Hobbycraft Kraft range. I haven’t decorated them, as I know Danny will want to collage them and decorate them his own way in his own time. On top of this “shelf” we placed his desk tidy to keep all of his homework stationery. He can pull out his desk tidy, put it on the table and then access his homework and paper. There is still enough spare space for him to store his calculator, dictionary and other school items during half term when he empties his bag. Some of his school files are decorated with these Letterman stickers which are perfect for school style. While I’m sure it won’t be as tidy once we reach the Easter holidays, I love how it’s encouraging Dan to keep his school things more organised (there is no excuse for him to not be able to find his homework/school books now although I’m sure he’ll still try to think of one!). 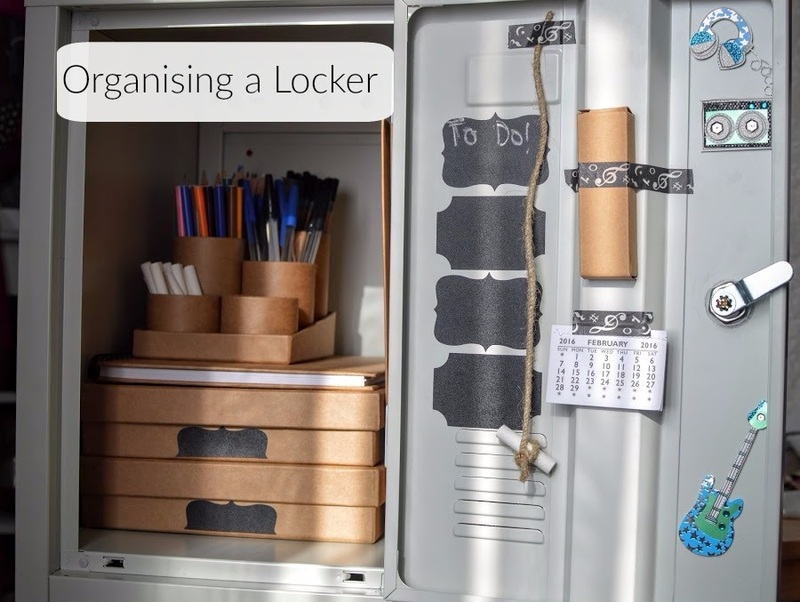 What would you use a locker to store? I would love one for my craft and photography items. Thanks to Action Storage for sending us this fab Atlas Locker and Hobbycraft accessories.